Just a quick post as it’s been a while, the above photo is my collection of LIFFE badges that were distributed on the floor to commemorate a product launch or benchmark attained. There are probably a dozen badges that I know I don’t have but they’re for minor products generally and this is certainly one of the more, if not the most complete, collection out there. If you happen to have any which aren’t shown, please email me (tradingpithistory ‘at’ gmail.com) as I’d love to expand this collection. In the US we refer to these as pinback buttons but apparently in the UK they’re called badges. Of the ones shown, the most notable are side by side in the middle right, the Bund futures launch and the FT-SE 100 futures. My favorite just for appearance is probably the mosaic pattered BTP futures launch badge from 1991. Any mention of that contract reminds me of a comment a friend once made of it that LIFFE’s BTP pit was more corrupt than Sicily. My collection of CME and CBOT buttons was expanded quite a bit since I last took a photo of them and at some point I’ll have to do another photo. Next up, hopefully later this week, is another post I’ll have to do that’s also London related, regarding one of my most favorite and historic items in my collection of trading floor stuff. The bag of bucks was something that really epitomized the trading floor as it was the type of thing that could only be thought up there. I can only speak to my observation of it a couple times on the CME floor in the equity index quadrant, as a clerk around the S&P pit in 1999 and 2000, but have to imagine it occurred also at the CBOT and elsewhere more frequently at the CME before I got there. Like anything with the trading floor, it’s concept was very simple. The person running it would walk around the trading floor and announce that they were starting a bag of bucks later on and specify some additional details like if it was for $20 bills or $100 bills and if a single bag for everyone or if there’d be a second bag that was for clerks only. In those days, clearing firms had a fair amount of cash on hand which could be withdrawn from a trading account so the sums could escalate easily to five figures. To participate, all it took was to write your name or badge on the bills and drop them into the bag, unlimited. Once the collection was complete, the bag would be shaken a bit to mix it up then someone would get the honor of pulling a single bill from the bag and whoever’s name/badge was on that bill won the entire bag of bucks. Tipping out a cut to the person who organized it was the only vig. 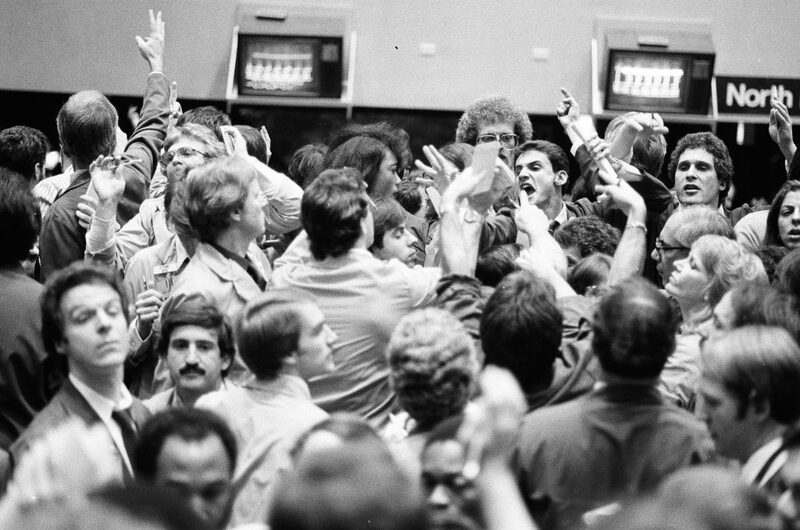 Although the bag of bucks encapsulated the spirit of the trading floor, it also juxtaposed the function of the trading pits. Since the bag of bucks was a closed activity funded only by participants on the trading floor, it was essentially shuffling money around in a lottery style, zero sum game. The trading pits required outside order flow to trade against and as I’ve written before, locals wanted to trade with brokers filling outside orders rather than profit off other locals. Another thing was for all the billions in notional value that exchanged in the trading pits, none was done in tangible cash. Good traders always had an edge to base decisions on and the bag of bucks was a pure gamble, albeit a simple one for entertainment more than anything. It also wasn’t necessarily verboten to speak in terms of dollar amounts but rather than talk dollars, traders generally speak in terms of “ticks” when discussing money on the floor. 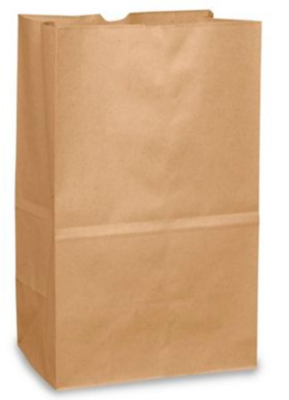 Obviously, the CME couldn’t condone the bag of bucks so it had to be done a little quietly. There were other activities like Super Bowl square pools or making markets in sports events which can be found in any workplace but the bag of bucks was unique to the trading floor. Before my time at the Merc, I also heard that when an adjacent street was closed, some fat guys from the floor were organized to race each other. Betting on fat guys racing is also something I can’t imagine happening anywhere other than at the Chicago Merc. The eurodollar futures contract is over 37 years old and having traded it for about half it’s (and my own) lifetime thus far, I was quite pleased to obtain this roll of film which documented the opening trading day of the contract at the Chicago Mercantile Exchange on December 9, 1981. There’s an issue embedding the file so click this link HERE to see the entire film roll of photos which will open up the uploaded 41MB pdf file. When the LIBOR based contract was launched, the interest rate was over 13% which is pretty much unthinkable now considering the current environment of zero or negative rates across the globe. Not only is the volatility unimaginable with 13% interest rates but I can only think that the bid ask spreads were wide enough to drive a truck through in that trading era. Meanwhile as I write this, the size in front month eurodollars is 70k x 100k (including a single order of 30k on the offer). Another stat I can throw out there is according to my historical data, eurodollars had about 3.5 million open interest when I started as a clerk for some local traders there in 2000 and that ballooned to over 17 million a year ago but is down to about 12.5 million currently. This FRED chart shows the LIBOR rate going back to the 1970s and illustrates the downward trend in rates since the day pictured, with a lot of credit due to the eurodollar contract and other financial futures, which presented hedging opportunities and reduced uncertainty to the capital markets. 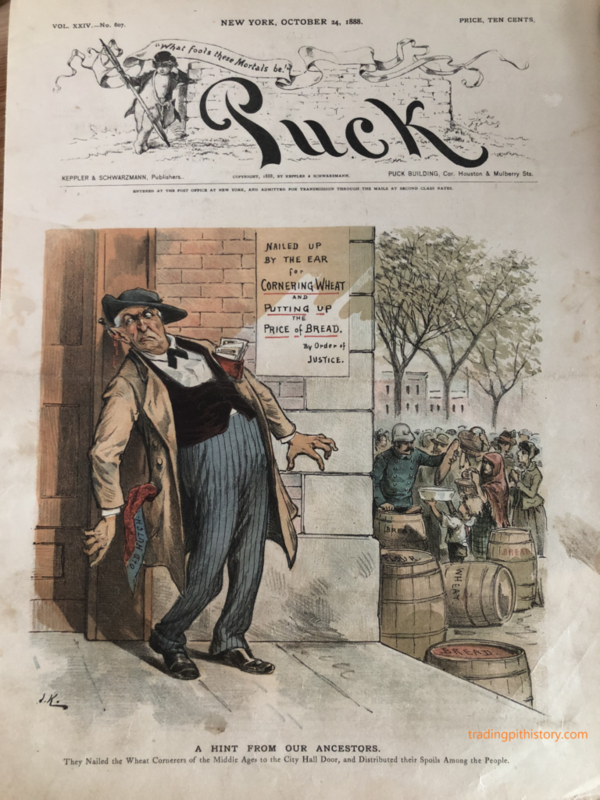 Late 19th century satire publication, Puck Magazine, ran a cover story in 1888 advocating retribution against the largest CBOT trader of the era, Benjamin “Old Hutch” Hutchinson, after he orchestrated a corner which helped squeeze the price of wheat from 90 cents a bushel to $1.60. The illustration is pretty much a libertarian nightmare of state sponsored theft and redistribution of private property which was lawfully earned. I could not find particular examples of speculators being punished through cropping (the official name for the punishment) although Victor Niederhoffer wrote in his excellent essay, The Speculator As Hero, of severe punishment of those who violated price controls during the siege or Antwerp in 1585. If anyone can find an example of speculators actually getting nailed by their ears, leave it in the comments and I’ll include it in the post. It’s hard to watch but youtube has videos of people willingly getting their ears nailed to a post such as this one (click here). Medieval punishment techniques are an internet rabbit hole that’s tough to go down because apparently it wasn’t just a singular punishment like cropping, other brutal techniques were often combined to maximize the pain. Quick note: It sure has been a long time since I logged in, the website software even changed since I last posted. Last year was my busiest trading year volume-wise and nearly my busiest for travel as well, add into that all sorts of kid activities w/my 4 year old and this project just fell by the wayside. We’re starting the year with a couple months in Singapore so appropriate to get the blog warmed back up and pickup on a subject it left off on. Lots of great content to post up as I’ve picked up some awesome historical trading artifacts in the past year that I’m excited to share eventually. With the old SIMEX trading floor at One Raffles Place long torn down to make way for a higher building, there isn’t much left of the Barings scandal in Singapore but Harry’s bar on Boat Quay still has a couple remnants. Harry’s is famously the bar most associated with Nick Leeson in Singapore, to the point that it’s listed in guidebooks and walking tours will stop to note of it’s association. To anyone who hasn’t been to the Harry’s location recently, it’s totally remodeled with the bar moved across to the other side of the room and doesn’t look anything like it used to inside. On my recent visit, I settled in and looked over the menu to see if there was anything to play on it’s past as a trader bar. Sure enough, they have a Bank Breaker cocktail which consists of a shot of whisky dropped into a glass of Midori and soda. The Midori references the Japanese Nikkei futures Leeson traded and I assume whisky because he’s from the UK. It was a slow night so I got to chat w/a waitress who worked there since the mid 90s and she was able to share a lot of stories from when the bar was filled with SIMEX traders. She also brought out what’s likely the last bottle of Leeson Lager (88888 Reserve “Probably the World’s Most Expensive Beer” US$ 1.4 bn proof) to let me take a picture of it. 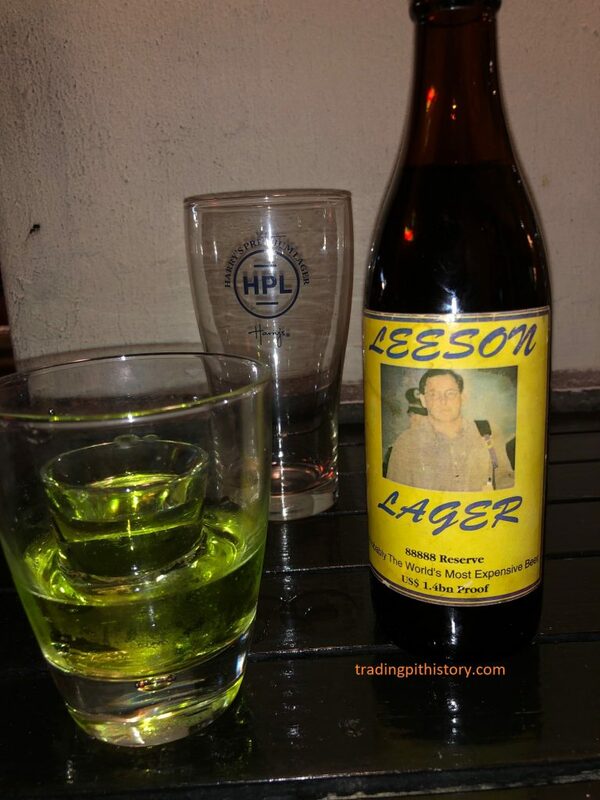 Leeson Lager was limited to 100 cases and brewed by a Hong Kong brewery in 1995. A friend of the blog, Felix K., wrote in and provided a link to an extensive interview that Leeson gave to Singaporean magazine Expat Living. The entire interview is worth reading but in particular, he commented that his time spent at Harry’s bar is more of an urban legend. “Harry’s on Boat Quay is still a popular haunt for city types. When you went there to have a drink at the end of the day was it done with a sense of celebration or nervousness? It’s one of the great myths of my time in Singapore; I very rarely went to Harry’s on Boat Quay. Yes, it was a popular place with expats. Yes, I was an expat, but as I mentioned previously I preferred to socialise with the locals that worked for me. If we did go for a drink after work it tended to be to bars at the other end of Boat Quay. One in particular was called Big Ben, it had a pool table, you could play darts and we knew the bar staff reasonably well. If a client or somebody from London was visiting, I might have had one drink in Harry’s but that really would be it. At the time, I was living two lives; the reality of what was happening on the trading floor as opposed to the lies that I was positioning to everyone else. The last thing that I wanted to do at the end of the day was dissect how the trading day had gone which was typically the subject of discussion amongst the expats in Harry’s. I wanted to get away from all that. 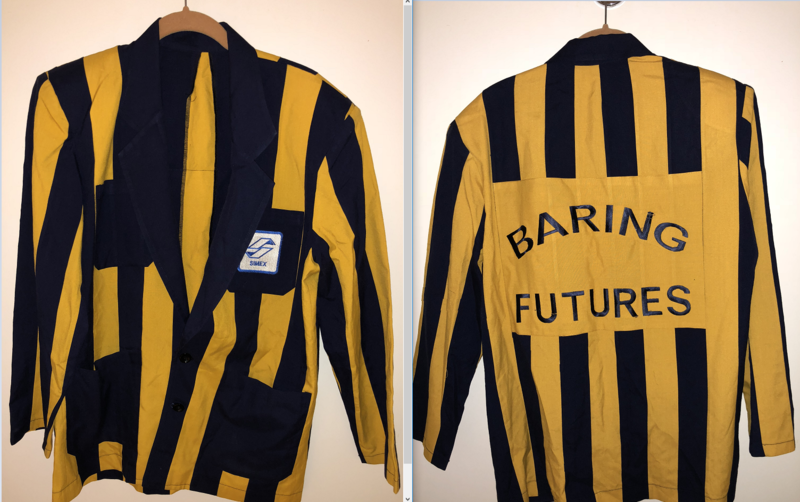 I see that Nick Leeson is continuing to sell replica Baring trading jackets so this is a good time to present what an authentic Baring Bank trading jacket from the SIMEX exchange in Singapore looks like, as this one pictured was a recent addition to my collection. The above jacket was issued to one of the lead execution brokers on Leeson’s Barings desk with the acronym DIN and whose nickname was “Fat Boy.” Anyone who has read the book Rogue Trader should recognize the nickname and role easily. I had actually bought this jacket in 2011 but didn’t get my hands on it until recently because the original purchaser wouldn’t ship it outside the UK upon purchase so a friend in the UK received it until he finally sent it on to me earlier this year. The original purchaser got the opportunity to purchase this jacket from KPMG, the Barings bankruptcy liquidator, in 2007 as a consolation for losing the ebay auction for Leeson’s original trading jacket which was auctioned off. I’m not sure what the price he paid KPMG for this particular jacket, as it was blacked out in the correspondence I was given for documentation, but his losing bid for Leeson’s jacket on ebay was over 16,000 GBP! This is the second Barings jacket from Singapore I have and don’t really need two but also don’t sell anything in my collection so perhaps I’ll see if a museum like the British Museum would like one as a donation. It’s been a while since I’ve posted after being so busy w/trading and other stuff, but today I got the chance to sort some of my trading floor pinback buttons from various exchanges and took a photo of whatever could fit on my coffee table. The LIFFE and CBOE pinback buttons are not included on this photo due to space limitations. You should be able to click on the photo to zoom in and read what the various buttons were commemorating (if not right click and select View Image). A quick categorization starting from the bottom is index futures, interest rates, currencies, metals/energies, agricultural, meats, commemorative then misc exchange. There’s various exchange pinback buttons I know of not having but this is the vast majority and includes all of the major ones. I am buying these to add to my collection so please let me know if you have any to sell, especially for the ones that I don’t have! Email me: tradingpithistory ‘at’ gmail.com please. However, I’m not selling any but am open to trading some of my doubles. For those who never worked on the floor, these exchange pinback buttons were given out at the entrance of the trading floor on a single morning only to celebrate a new contract launch or occasion. Over the years I’ve collected them from various former floor workers since I, like most people on the floor, threw them away by the end of the day, if not within minutes of obtaining them by adding to the detritus of the trading floor. Everything in trading is ephemeral, so to capture some of the moments via these physical items is very special. I got some other cool stuff in recent months to post about and will do so in the next week….